- Should you ever consider trading a player like P.K. Subban or Erik Karlsson? - And a classic YouTube clip that features the birth of the Penguins/Rangers playoff rivalry. Wow, a Bolsheviks reference? Sean, ever consider adding rasslin' to your blog? I for one would read the hell out of it. 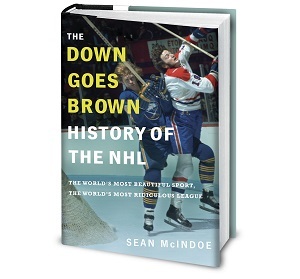 Maybe instead of "Down Goes Brown" you can have "WITH GOD AS MY WITNESS HE IS BROKEN IN HALF."